ABOUT: hosts Yannis Kondaratos’ third solo exhibition. 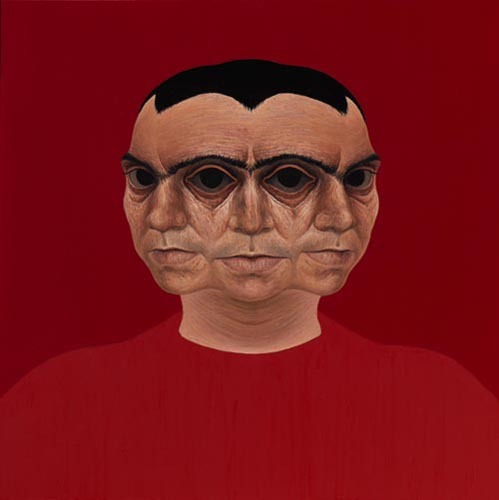 In twenty and more oil paintings the artist’s face takes the place of the symmetrically composed symbolic and biomorphic elements of his previous large canvases. For his natural scale self portraits, the artist adopts a frontal and therefore, symmetrical positioning of the face –rather rare in the genre’s tradition- which is placed in a monochrome background, while emphasis on its main features renders the person recognizable. However, the painter does not aim at a realistic or expressionistic treatment of his own image. He prefers accentuating or deforming certain of its aspects in order to constitute the human person as autonomous presence within the space of the painting.